I wish to take this opportunity for you to join us in northern Italy to be part of our 3rd Annual Italian Music Festival held on 1 May 2018. This event is for High School and Middle School Band, Choral and Strings ensembles in Europe. 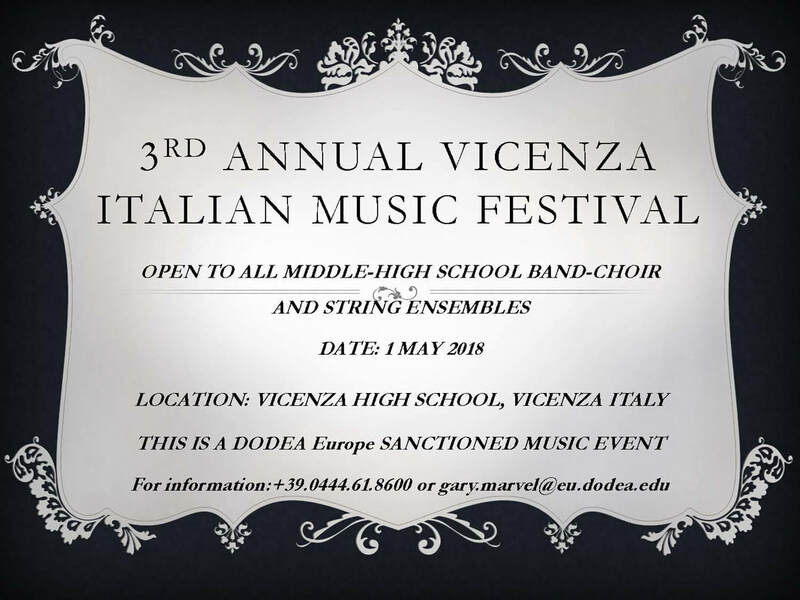 What is the Vicenza Italian Music Festival? SME (Subject Matter Experts.) The SME's will use verbal comments live while your ensemble is performing, written comments, and also will work with you and your ensemble directly after your performance to highlight the great things that you are doing and also give recommendations on how to elevate your group to the next level. Many of our new CCRSA Standards will be evident in this musical event. and cost will be by individual ensembles and at no cost to DoDEA. If you are interested in being part of this event, please contact me for more information.